For the better part of the game Tuesday at the Mack Chase Athletic Complex, the Bulldog soccer team was in control against the talented and speedy Colts of NMMI. But a four-minute lapse at the start of the second half and another brief breakdown around 10 minutes later spelled the difference in a 6-4 loss that, regardless, saw the ‘Dogs play all-around solid soccer. “It was a good game overall,” head coach Phillip Jowers said today. “I’m really pleased with the boys. We played a lot better, especially in the first half. NMMI jumped out to a quick lead with a header that ricocheted off the Artesia defense and into the net five minutes into the game. From there, the ‘Dogs’ defense stiffened, however, with freshman keeper Aaron Natera saving a direct free kick with 27:01 to go in the half, then blocking two hard shots moments later off a corner kick. 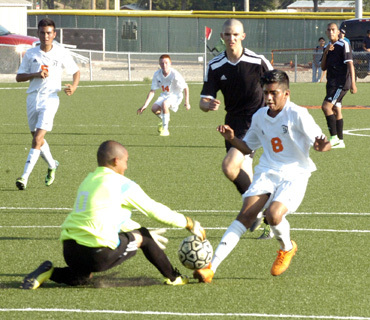 Artesia’s offense didn’t find their rhythm till late in the half, but once they did, they ran with it, taking a trio of goals out of the final 10 minutes on a sliding shot, a one-on-one situation, and a hard, long-distance goal, all from senior Christian Lopez. The Colts were able to sneak one in, as well, at the 3:39 mark when a block of a point-blank shot sailed high in the air and was headed in to trail by one at the break, 3-2. A quick start to the final 40 minutes by NMMI turned the tables by just the fourth minute, 4-3, and although the Bulldogs were able to reinstate the deadlock, 4-4 with 31:10 to go on a shot by Alex Ruiz, they would be unable to find the back of the net again despite 12 shots on goal. The Colts, meanwhile, picked up their fifth and sixth goals somewhere around the 20-minute mark (times unknown due to two instances of a non-running clock) to add insurance to their win. “Our movement was good,” Jowers said. “Everybody was moving off the ball better. We need to work on a few more things, but for the most part, I was pretty pleased with the performance. The ‘Dogs (1-3) will now prepare to head north for a weekend double dip with Capital and Santa Fe, and Jowers says he will be looking for continued improvement from his athletes. “We’re really going to focus on composure this weekend and just kind of putting it all together before district,” said the coach.